It is imperative in today’s online marketing climate that any company, organisation or individual influencer has a good social strategy put in place in order to maximise their business efforts. Unless you have previous experience in this field, knowing how to set up and get started with your social strategy can be a daunting task, especially if you are relying on it to bring in traffic and ultimately complete conversions. First things first, research. No effective social media campaign, or any other marketing strategy for that matter, has been carried out without a huge amount of research being done first. What time of day your audience are most active? How engagement your competition get? The reason we need such an in-depth analysis of our audience is so that we can later use this information when creating and organising our strategy. Knowing the best time to tweet, for example, will help when developing your social media content calendar. There are many different tools that can aid this process; Hootsuite is a great tool for social listening and will provide you with insights into what content your audience is engaging with. SocialBro is also a fantastic tool that can be used to analyse twitter accounts, including metrics on when the best time to tweet is and the influence, reach and klout score each Twitter user has. Make sure you look into these important factors before setting any kind of social goals and objectives, but don’t get caught up in doing too much research, work out which factors are most important for your brand and focus on them. It is vital that you have a clear vision in the forefront of your mind throughout the entire social media campaign, and a great way to ensure you are sticking to it is to have a specific list of aims and objectives. Make sure each of these are SMART (Specific, Measurable, Attainable, Relevant and Timely). Measuring a campaign is one of the most important things to take into consideration. Without clear measurement, how do you know if the campaign you have put all of your time and effort into has actually worked? It is vital to determine right from the beginning what you need to be measuring, and what specific metrics are relevant to your campaign (i.e. the amount of ‘likes’ your campaign has may not be relevant to the end goal if you are looking for influencer engagement levels). In regards to the above metrics, it is imperative that you run a full social media audit (if you are an existing entity) to have something to benchmark your future measurements against. One thing to note; measurement isn’t a one time thing, you need to be periodically measuring your social media strategy, report on the findings, and then adapt and refine to suit the results you have found. Imagery used, i.e logos, profile pictures etc. The last point I mentioned there was tone of voice. This is a major aspect to take into account when ensuring brand consistency and effectiveness when reaching out to your target audience. Before any content is posted, it is important for you to decide on the perfect tone of voice for your company. For example, if you are a law firm, it is probably best to adopt a corporate and professional tone of voice; given the values your company will want to adhere to. Once you have decided on a tone of voice, make a note to keep this consistent on each platform. The last thing to take into account in the introductory phase of a social strategy is how you are going to push engaging content through each of your platforms. Each of the previous phases should give you a good idea of what kind of content your audience engages with, as well as which platform they are most likely to engage on. This will help you work out what your tone of voice should be and what schedule you should follow. As part of your content strategy, I would highly recommend setting up a content calendar. The content calendar should include organised details of what date and time posts should be tweeted, what platform the post will be on, and what type of content is to be posted. You can actually schedule future posts using tools such as Hootsuite, meaning you don’t have to bother setting up a new post every day. By using the content calendar, both yourself and any other contributors, such as copywriters or graphic designers, can see a detailed layout of when content needs to be finished and published; in turn creating a smooth synergy between different teams. 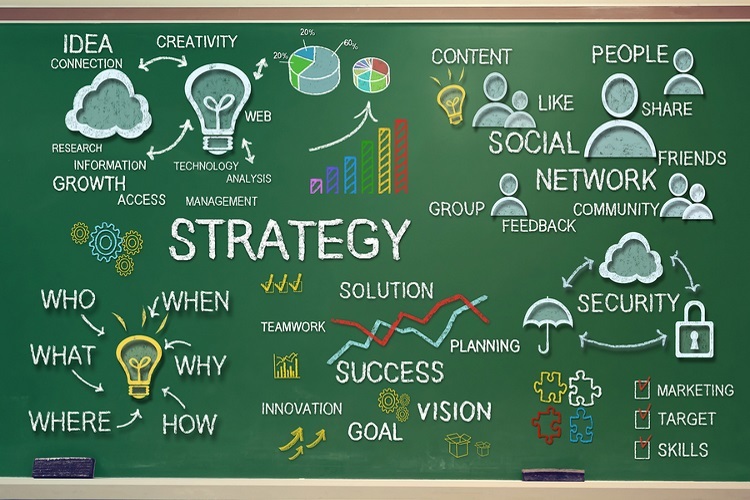 These are just a selection of steps needed to set up a solid social strategy. There are many more aspects that can be looked into, such as Facebook ads. This being said, the above steps are a good place to start when formulating your social strategy. If you have any tips, or advice on tools to use for implementing and measuring a strong social strategy, feel free to let us know below.